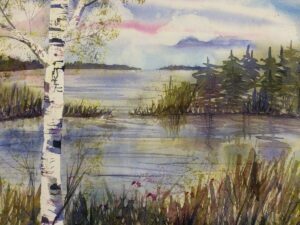 Beginner's Watercolor Painting - Northwoods Landscapes - Land O' Lakes Area Artisans, Inc. Paint a Northwoods watercolor landscape in this class for beginners. Dress for a fun mess! LOLA’s resident artist, Wendy Powalisz teaches this fun class for beginning painters. Join her for a foray into the magic of working with watercolors. Learn all the very basics of transparent watercolor painting. From the foundational washes, to fun techniques that use a variety of tools, students will gain confidence, and learn to appreciate this expressive medium. An 11 x 14 north woods landscape will be created. Powalisz is an award winning watercolor artist with over 24 years of experience. Her work is currently for sale at Artistree Gallery in Land O’ Lakes. She is the Program Director and a teacher for Land O’ Lakes Arts/LOLA – a non-profit arts organization. She teaches both children and adults, beginners to advanced students. She loves to customize classes just for you, or a group of friends. Call the LOLA office, and talk to Wendy for details on a special class!